A housing unit and a shop of up to 100 sq.m. A housing unit and an office of up to 250 sq.m. The real estate purchase can be made in the name of a legal person, provided that the applicant and/or his/her spouse are the sole shareholders, and that this company is registered in Cyprus or other member state of the European Union or European Economic Area. The applicant must deposit a minimum capital of €30.000 into an account in Cyprus for a period of 3 years. It must be proved that the transfer of this amount has been made from abroad. A prove for secure annual income of at least €30.000. Additional amount of €5.000 is required for every dependent person (spouse and children) and €8.000 for every dependent parent or parent-in-law. The origin of money should be from abroad, and may include the following: salaries from employment, pensions, dividends from shares, fixed deposits, rents etc. Spouse’s income may be also taken into consideration for the total calculation of Annual Income. The applicant and the depend adult persons must have a prove of Clean Criminal Record from the country of their residence. The applicant covers his/her spouse and children under the age of 18.
for children with permanent disabilities documents from health institution that confirms it. Children who study in Cyprus Universities must present Student Visa and keep the right to apply for PR after the completion of their education. An additional annual income of €5.000 for every such dependent child is a must. An Immigration Permit may also be granted to the parents and parents-in-law of the applicant/holder of an Immigration Permit, with the additional annual income of €8.000 for every such dependent parent. Investment of a Higher Value for the Children who are not financially dependent:An Immigration Permit may also be granted to children of the applicant over the age of 18, who are not financially dependent on the applicant, provided that the market value of the purchased property attributed to each such child is at least €300.000 (excluding V.A.T). The acquisition of the real estate must be made solely in the name of one or/and both parents, or solely on the child or on both parents and the child. Each child shall submit the necessary documentation with his/her application (e.g. secured annual income of €30.000, a deposit in a financial institution in Cyprus amounting to €30.000, which is bound for 3 years). The holder of an Immigration Permit is obliged to acquire ID card in Cyprus within one (1) year from the date of the issuance of Immigration Permit Certificate. For that purpose, the applicant and his/her dependents must visit Cyprus to give Biometrical details. 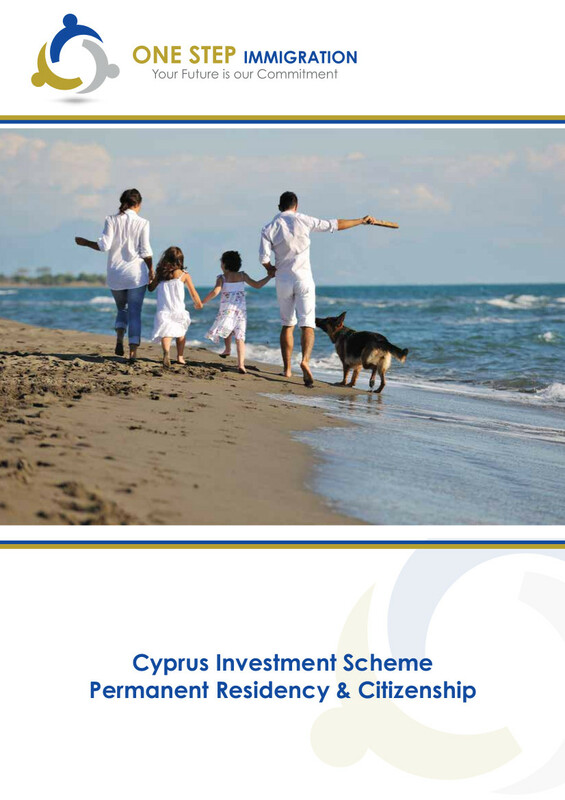 All holder of such a permit (including dependents) are obliged to visit Cyprus at least ones every two (2) years. Otherwise, the Immigration Permit is automatically cancelled. Applications accompanied with the required documents must be submitted directly to the Civil Registry and Migration Department (CRMD), personally or through an authorized representative. A fee of €500 is payable with the submission of the application. Applications submitted through authorized representatives must be accompanied by an authorization letter from the applicant stating the particulars, full address and contact number of the representative. The application shall be processed by the CRMD and be submitted to the Minister of Interior, through the Permanent Secretary of the Ministry of Interior. An interview with the applicant shall take place only when deemed necessary by the Permanent Secretary of the Ministry of Interior. The Ministry of Interior shall notify the applicant or his/her authorized representative and the CRMD as to the decision of the Minister of Interior. Provided that all the criteria of the above stated policy are met and there are no reasons with regard to either the criminal record of the applicant or to public order and/or public security issues, the application shall be examined by the Minister of Interior in a positive manner and an Immigration Permit shall be issued. The procedure for the examination of the application shall not exceed two (2) months from the date of the submission of a complete application.